I was told that I have to introduce the Student Technology Responsibilities poster. But, being the rebel that I am, I didn’t want to just read it to the students, so I decided to make it a bit to attach to my discussion about digital citizenship that I was already planning to have. 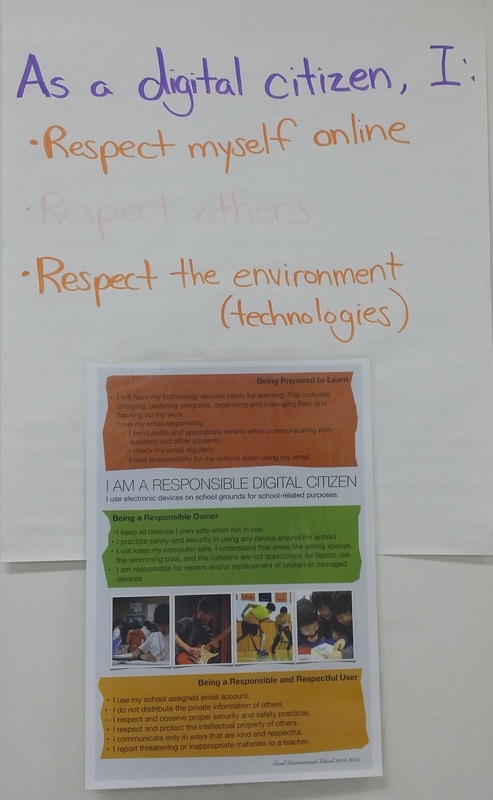 The students and I decided that we needed to understand not just what a digital citizen is, but also what they do. Being the great students that they are, they started telling me about how a good digital citizen uses T.H.I.N.K. whenever they post and got stuck there. We paused, and I let the students go off to draw and write about what a good digital citizen might do or look like. We then took a few days more to discuss, write, and draw what that looks like. The students decided that respecting others online is about being kind to others, and not asking for information that doesn’t belong to them. Respecting the environment led to the tools that we use in technology, and how important it is to “hug it (computers we use) like we love it” and to be gentle with the devices. Huggin’ it like she’s lovin’ it. Thus, we were able to create a working definition of a digital citizen in our class.